These are a great "sitting watching tv" project, they are inexpensive, easily personalized, and make nice gifts. 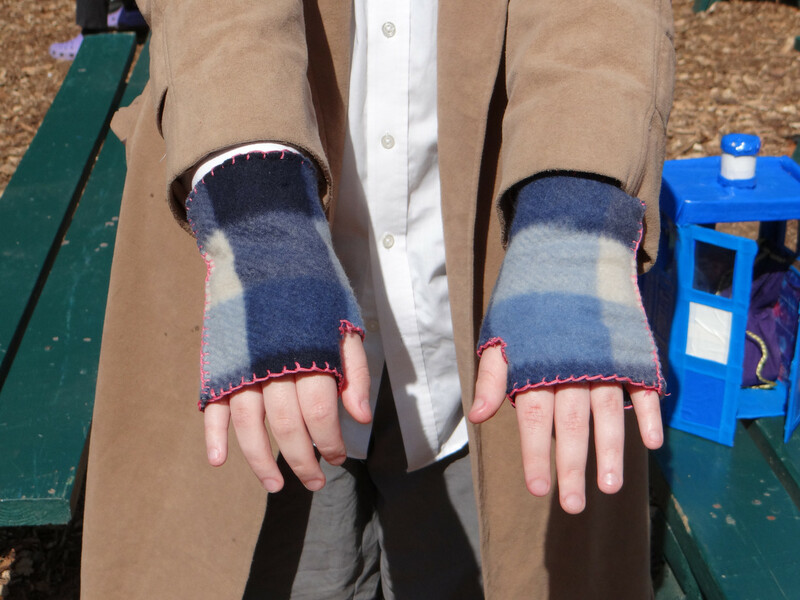 The pair above was made from a scrap of fleece that I got in a bag of scraps from the thrift store. About fleece- It's a knit so it won't fray, which is why it's used for knotted blankets. 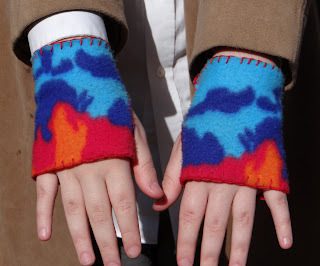 It will have more stretch in one direction than the other, so check the stretch, you want the greatest amount of stretch to wrap around your hands, not in length of the mitts. The greatest amount of stretch is usually selvage to selvage (finished edges). The mitts, as shown above, take 2 pieces of fleece 7x9 inches with the stretch along the 9 inch side. A 1/4 yard of fleece is 9 inches wide and about 60 inches long so you could make 3 pairs off a quarter yard of fabric. Since fleece goes on sale frequently, this makes it a very inexpensive project. The reason I like the chenille or embroidery needles in that size for working with fleeces is that they are sharp enough to go through easily, and the eyes are the right size for 5-6 strands of embroidery floss. Because of how thick fleece is, using all the strands on a skein works well. Start by cutting 2 pieces of fleece that are 9 x 7 (8x7 for smaller hands) inches, making sure the greatest amount of stretch is on the 9 inch edges. Fold each piece in half, wrong sides together, and make 3/4 inch cut in the fold 1 inch from the top of the fabric. Make sure the cut is mirrored on the other piece so when they are laid together with the folds facing each other the slits and edges match up. Test the thumb hole to see if you need to make the slit a little bigger. Cut only a little bit at a time. The rest is very simple hand sewing in blanket or buttonhole stitch stitch. For the stitching, I make small knots and pull it through one layer then then stitch the two layers together to sandwich the knot and tail between the layers. For the single layer parts, I make small knots on the side, then stitch over the tail to keep it neat. First, stitch up edges of the slit, because you want it to be a bit stretchy, leave some slack in your stitch. Take a couple stitches on each side of the slit to secure that edge and keep it from stretching too much. Fold in half, and blanket stitch the 7 inch sides together. Now stitch around the top and the bottom, single layer, to make a finished edge tube. Make sure to leave some slack for stretching when you put them on. The first pair I tried to make, I put the stitched edge on the inside with a thumb hole. My daughter liked the way they looked, but I didn't like the feel of the seam there. This pair is also a bit shorter. They can be shorter or longer, or have a strip of another fleece inset for decoration. Today we went to our local renaissance fair. 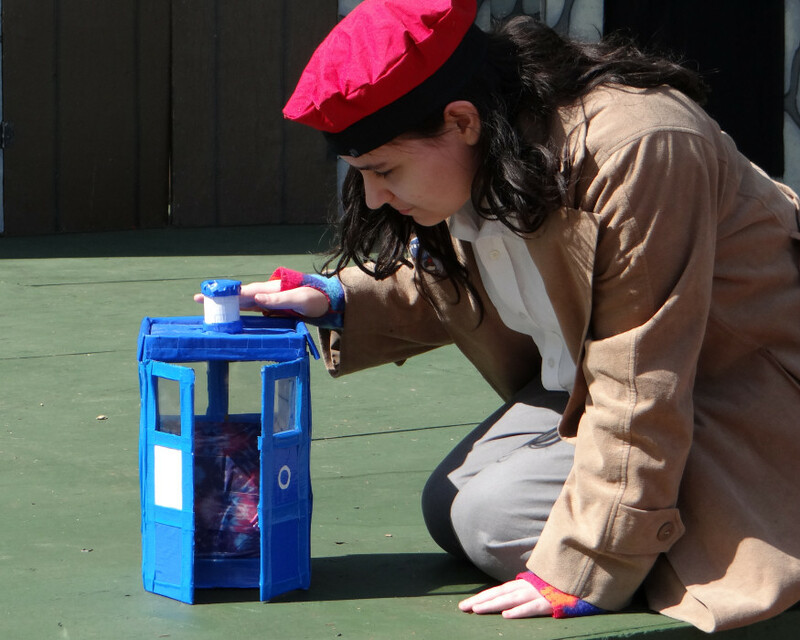 My daughter brought along the TARDIS she made out of duct tape so we could get lots of photos. Did you know that when you bring a TARDIS to something like a ren fair, lots of people will stop to talk to you about it? The basic shape was made from cereal box cardboard, then covered in duct tape. The windows are cut out of clear packaging plastic. Thank you! I'm glad you like them, and it's always okay to pin from this site and I appreciate it so much.